As a shop owner, you already know that online customers are quite savvy—especially when it involves looking for gifts during the pre-holiday season. They hunt for the best deals, and you look to provide the best service while still staying profitable. One key to mastering this balance is understanding your shipping cost options. Shipping costs can be a make-or-break factor for customers when purchasing online. So we have put together some tips to finding the right shipping options for you. It’s worth it, especially before the holidays! If you have ever purchased something online, you know to watch out for those sneaky shipping fees. Nevertheless, there are online shops who still wait until the final step of an order confirmation to reveal the shipping costs—so as not to deter shoppers. This can confuse customers and doesn’t help them complete their order. Our recommendation: Be transparent about shipping costs and simplify cost calculations. Make it easy for customers to view the shipping costs directly or easily calculate them (for example, showing shipping costs by weight). This makes your visitors feel secure and creates confidence in your shop. An FAQ section is a great way to address shipping costs. We love the way Black Yeti has answered questions regarding this and explained how to find the exact shipping cost for your country. In your Jimdo shop, you have several ways of adjusting the shipping costs for your products or services. The better the shipping price fits your product, the better your chances are that customers will purchase from your shop. So explore your options. Standard shipping costs apply regardless of the number of items in the shopping basket. Advantages for you: Billing, calculation, and labeling are simple. Shipping costs are calculated per order, not per item purchased so you can order several items and the shipping cost remains the same. This strategy works best if you’re selling lightweight items that don’t significantly increase your shipping costs if you add more to the package—like jewelry. Benefits for your customers: This option offers complete transparency. Customers know the total price at all times, along with the possible savings for larger orders. If you sell goods where the shipping costs increase proportionally to the weight of the product, we would recommend weight-based shipping. This applies to products that your customers order according to weight (for example coffee, tea or spices). Advantages for you: With this option, you can set the shipping cost for different weight ranges (for example, packages 0.00kg to 2.00 kg will cost $10 for shipping, packages 2.01kg to 4.00 kg will cost $15, etc.). Then, set the weight for each Store Item Element, and the system will automatically calculate the right shipping cost for all the items in the cart. This makes the calculation simple and you can adjust this according to the specifications of your shipping service provider. Benefits for your customers: Easy, comprehensible pricing due to weight spans. So you get a very fair calculation. If you apply several shipping options to your items (for example, standard shipping costs and weight-based shipping), the highest price applies to your customers. You may already be using tags in your Store Item Elements to create gift guides or show certain categories of products. But you can also use tags to create shipping rules. Advantages for you: If you sell small items (like stickers) and big items (like bikes) you can use a tag to assign the best-suited shipping option. These tags aren’t visible to customers so you can assign your products with a tag like “small-items” or “oversize.” This also works if you have one particularly unwieldy item in your store and you want to charge extra shipping for it. 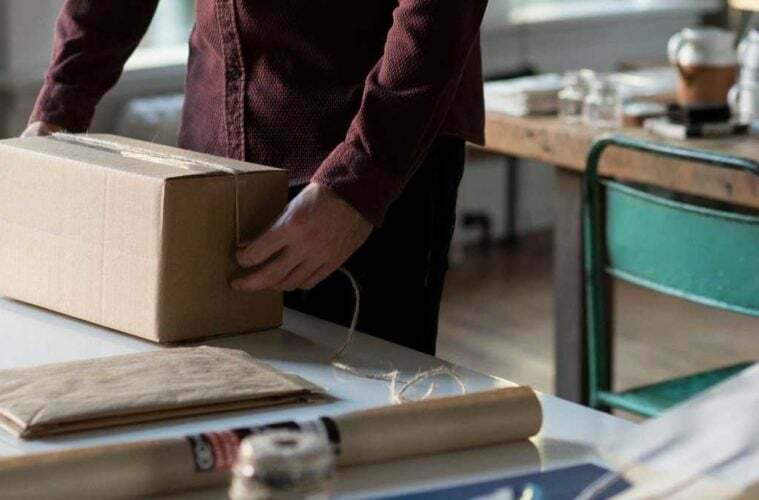 Benefits for your customers: The shipping costs depend on the nature of the individual product, so they’re perhaps more customer-friendly than, for example, the standard shipment. Weight-based shipping and tag-based shipping are both part of our JimdoBusiness package. This package also offers the possibility of choosing shipping based on weight or product tags (as well as by country or region). If you charge a shipping fee per product, shipping costs can quickly add up for big orders. But as a store owner, those large orders may be exactly what you want to encourage. That’s where maximum shipping cost and free shipping for large orders can help. 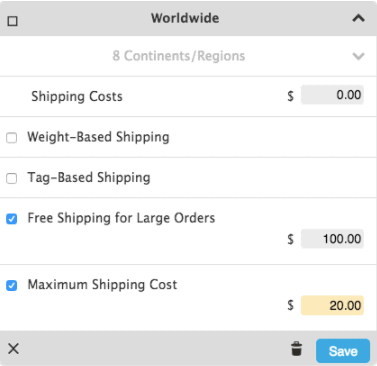 Use these options to either set a maximum limit to what a customer will be expected to pay for shipping (let’s say, $20) or to offer free shipping to customers who spend a certain amount in your store. This is a good way to reward customers for large orders by offering them a bit of a break on the shipping costs. Advantages for you: A maximum shipping cost allows you to define the maximum shipping price regardless of the number of products ordered. And free shipping for large orders might just encourage people to add a few more items to their cart to reach the free shipping threshold. If this option makes sense for your products, you can create a great incentive for your customers to order more. Turn these options on by going to your menu and selecting Store > Shipping Costs. Benefits for your customers: The more your customers order, the less they pay proportionally for shipping. Free shipping—is it worth it? Customers love free shipping, as studies repeatedly confirm. This is not surprising, as free delivery feels like money saved. Customers don’t have to add an extra sum, to the already perceived value, in the next step of the order. Although there is no one correct answer, it is often true that customers perceive free delivery, even at a slightly higher price, as a special service. So offering free delivery can often increase the chances of an order being made. Therefore free delivery can be worthwhile if you include the shipping into the product price, for certain actions or for a maximum shopping spend (for example orders over 50$). In the mind of customers, delivery is just as much a part of the shopping experience as professional product images or clear product descriptions. By having well thought-out shipping options you can really add value to a customer’s experience with your shop. So it can actually pay off to reconsider the shipping costs for your store. I hope you this gave you some ideas for your future or existing online store. How do you approach the subject of shipping costs before the Christmas period? I look forward to your comments!